Essential. Original and informative. Belongs in all African studies libraries. Well written and informative… a valuable addition to the impressive body of work and projects of the Rift Valley Institute. The Sudan Handbook, based on the Rift Valley Institute's successful Sudan Field Course, is an authoritative and accessible introduction to Sudan, written and edited by outstanding Sudanese and South Sudanese scholars and recognized international experts. The Handbook covers Sudan, South Sudan and the North-South borderlands though a set of essays by leading specialists, including Abdelrahman Ali Mohammed, Peter Woodward, Gerard Prunier, Jerome Tubiana, Derek Welsby, and Ahmad Sikainga. It offers an authoritative introduction to both countries, rooted in a historical account of the development of the state. The book is not limited to history and politics. It includes chapters on Sudanese popular music, the oil industry, and the archaeology of the early states on the Nile. The text is accompanied by purpose-drawn maps, a glossary, capsule biographies, a chronology. and a bibliography. The Sudan Handbook grew out of the RVI’s annual Sudan and South Sudan Course. According to Randall Fegley, writing in African Affairs, it is one of ‘a tiny minority of rare reference works that can be pulled off the shelf as a compendium of facts or read cover to cover as a collection of well-written narratives’. He notes the Rift Valley Institute's ‘tremendous influence on academics, policy makers, activists, and field workers’. Tom Porteous of Human Rights Watch, writing on the Lawfare website, welcomes the RVI’s efforts ‘to collect, preserve, and transmit knowledge and understanding of Sudan’s ground-truth’. A reviewer from South Sudan, Peter Run, writing in the Australasian Review of African Studies, comments on what he describes as a 'succinct and comprehensive text'. He highlights the ‘insightful analysis’ of oil and its influence on the Sudanese political economy and notes the timeliness of the discussion of ‘the clash between the traditional mechanism of conflict resolution and the state’s judicial system’. John Ryle is Legrand Ramsey Professor of Anthropology at Bard College, New York, and Executive Director of the Rift Valley Institute; Justin Willis is Professor in History at Durham University; Suliman Baldo was formerly Director of the Africa Program at the International Center for Transitional Justice; Jok Madut Jok is Assistant Professor of History at Loyola Marymount University, Los Angeles, and Undersecretary in the Ministry of Culture and Heritage of the Government of South Sudan. 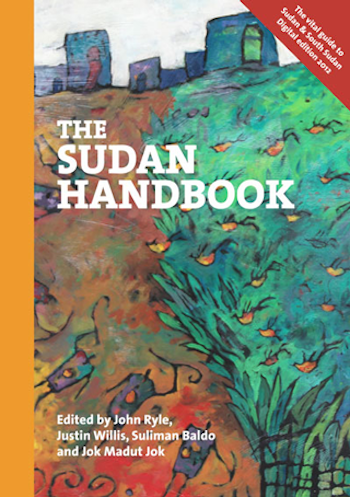 The Sudan Handbook is available from the RVI website in a free-to-download digital edition. The print edition is co-published by RVI and James Currey/Boydell & Brewer.